People like you can help to grow the urban forest in Dallas, and this will help improve our quality of life and provide benefits for future generations. There are few acts that can make a bigger difference than planting and caring for trees. Trees contribute to cleaner air, cleaner water, cooler temperatures, and offer many more good things to our community. Every person can make a difference. Get involved. Plant a tree in your yard. To be an advocate for Dallas’ trees and help conserve and expand our urban forest, why not become a Citizen Forester? A Citizen Forester serves as the city’s eyes, ears, and hands for tree related issues. Training will provide you with basic expert level tree care necessary to identify trees species, proper planting techniques, and identify hazards. All these areas are essential to conserving and eventually expanding our urban forest here in Dallas. To learn more or to sign up for classes, please view our Citizen Forester page. 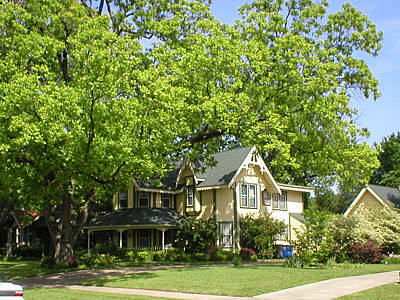 Perhaps the easiest way to conserve Dallas’ urban forest and to re-shade Dallas is by planting trees. Dallas has many neighborhoods and street medians that need shade and these public areas offer a great way to begin re-beautifying our city. Why not team up with your neighborhood association or business and spearhead a planting project? If that happens to be a challenge, then you may wish to consider joining in with the city’s many other tree planting projects. For more information, contact UFAC’s Tree Planting Team Leader, Tree-Planting Team Leader . Volunteers will assist the Committee, the public and its partner organizations in planting trees from various sources. In addition, Committee members will provide professional expertise or information to facilitate tree planting anywhere in Dallas. Plant a tree today and make a difference for tomorrow! Would you like to see more trees planted in Dallas? Perhaps you are fortunate to have the financial resources to plant trees, but lack the manpower or organizational resources to implement it. As an alternative, perhaps you wish to fund a tree planting. The committee has many ideas and locations for needed tree plantings, but obviously, due to costs of tree plantings and maintenance, like many organizations, the Committee is limited in the amount of trees it can plant. If you’d like to fund a tree planting, the committee would be glad to plant trees in public spaces on your behalf and will publicly acknowledge your contribution. As you may know, to lessen the burden on Dallas taxpayers, the committee is organized to accept tax deductible donations for tree plantings and other tree related projects.